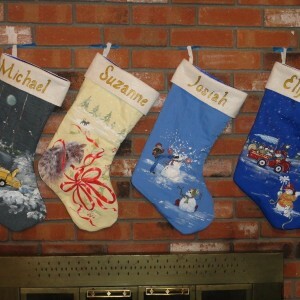 This third set of large personalized holiday stockings was created completely from scratch for a family with a young son. 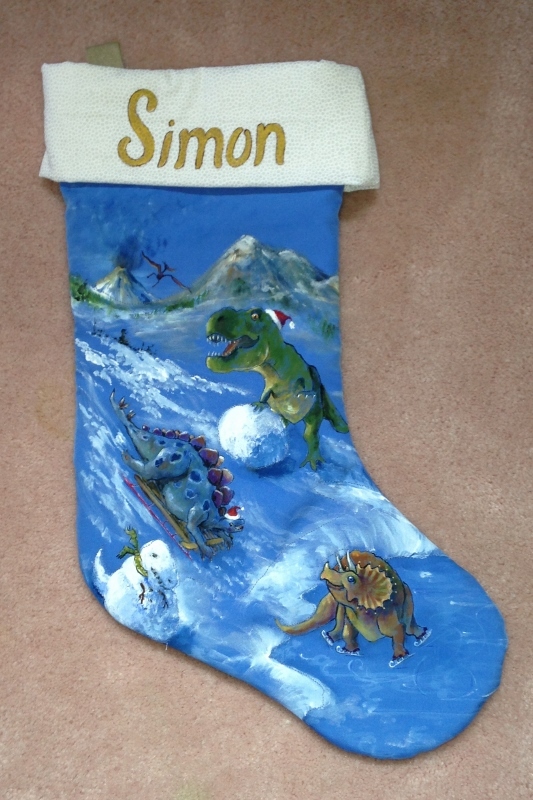 When the family requested dinosaurs, I had a moment of hesitation and then a burst of inspiration. 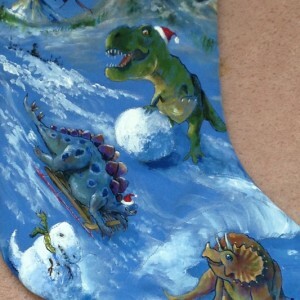 Dinosaurs must have enjoyed playing in the snow, right? 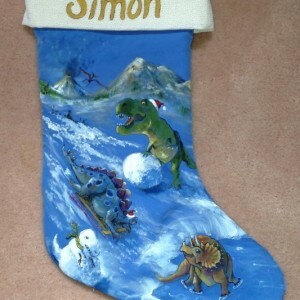 And they would have build snowosaurs wouldn’t they? 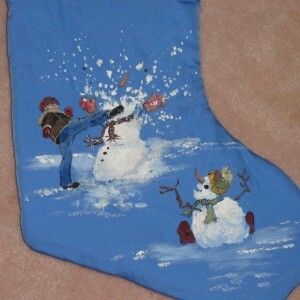 Do you see it??? 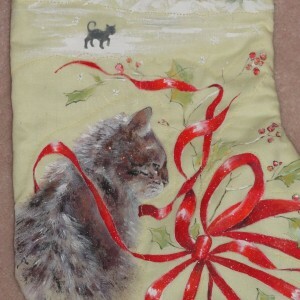 This cat with the red satin ribbon bow and Chickadees was based on a beloved pet. 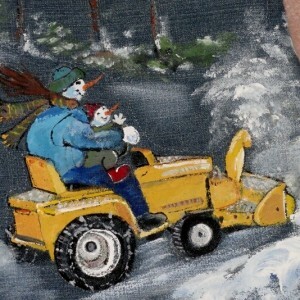 I really like the birch trees and the antlered reindeer for the Dad I placed the painted cotton fabric on quilt batting and machine quilted around the larger areas, and stitched straight lines of quilting on the back side. 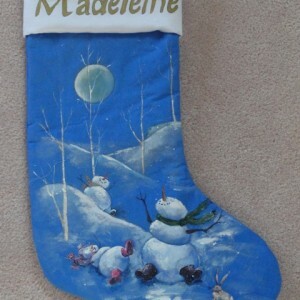 The approximately 16″ tall stockings have a satiny lining and a cuff on the top with the painted name name of each family member.. A sturdy loop is stitched into the top back edge. 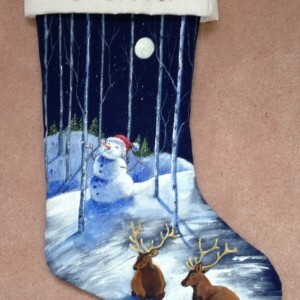 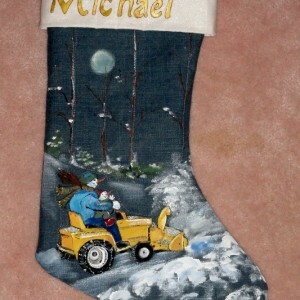 If you are interested in having me paint stockings for your family please contact me through this site. 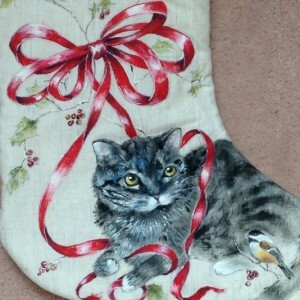 Taking orders now for December 2014 4 stockings for $400, 2 for $250. 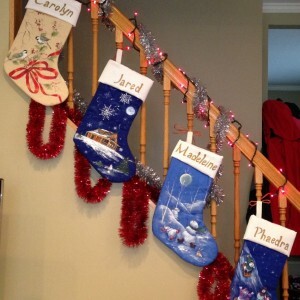 This second set of large personalized holiday stockings are created completely from scratch for a family with two young sons. 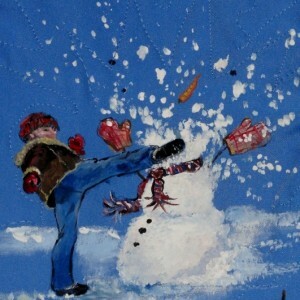 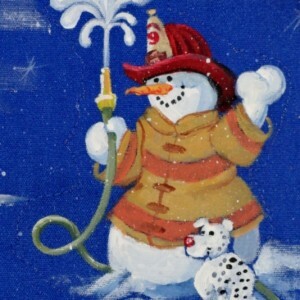 For the older son, who studies Tae Kwan Do, I thought he would ‘get a kick’ out of the exploding snowman, while younger brother would like the firemen since Granddad is a fire Chief. 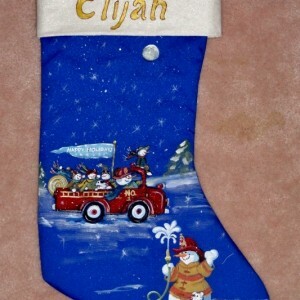 A cat with red satin ribbon is for Mom who works with animals and then there is Dad who loves his vintage riding snow blower! 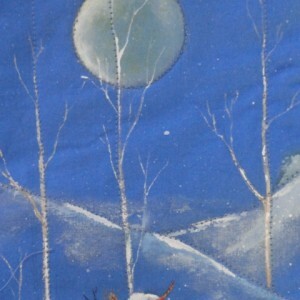 I placed the painted cotton fabric on quilt batting and machine quilted around the larger areas, and stitched straight lines of quilting on the back side. 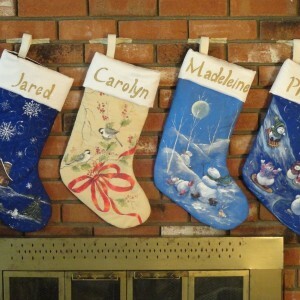 The approximately 16″ tall stockings have a satiny lining and a cuff on the top with the painted name name of each family member.. A sturdy loop is stitched into the top back edge. 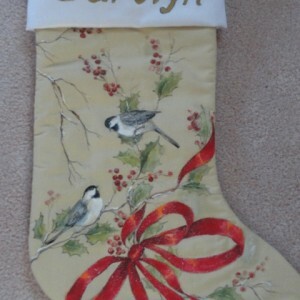 If you are interested in having me paint stockings for your family please contact me through this site. 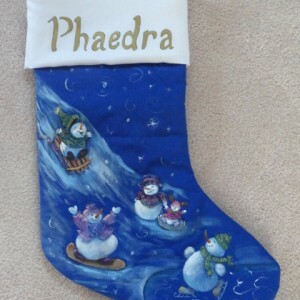 Taking orders now for December 2014 4 stockings for $400, 2 for $250. 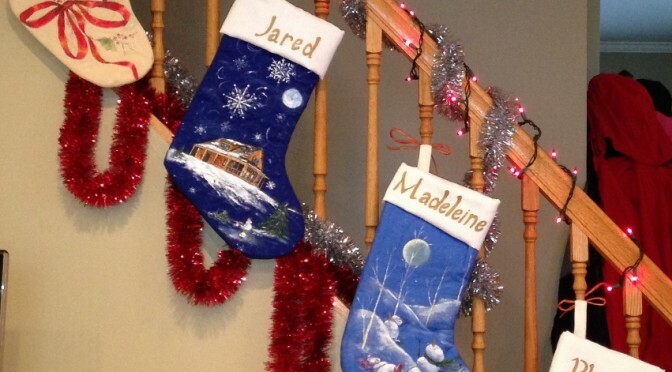 These large personalized holiday stockings are created completely from scratch. 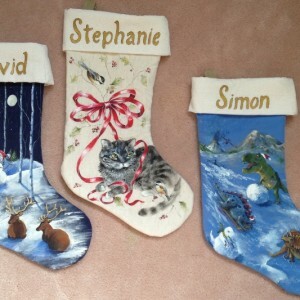 I painted this first set of stockings for a family with two young daughters. 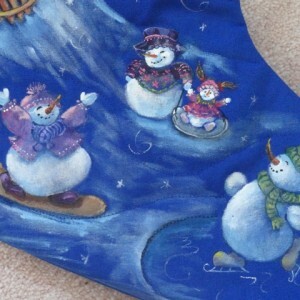 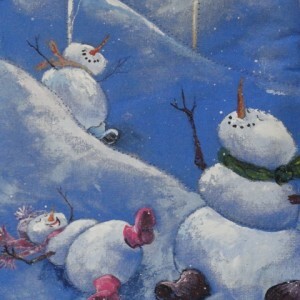 The snowmen are having a lot of fun, one of them is very partial to pink boots!! 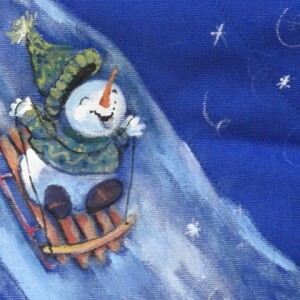 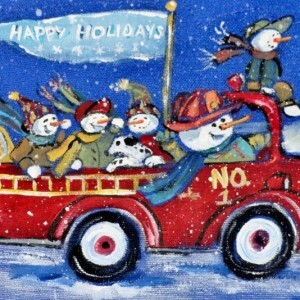 Everyone loves the face on the little snowman on the old wooden sled. 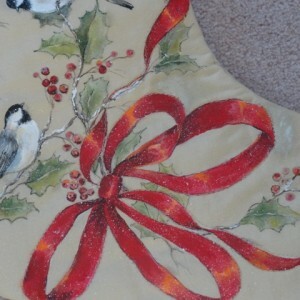 Chickadees, Holly and berries with red satin ribbon make for a sophisticated look for Mom. 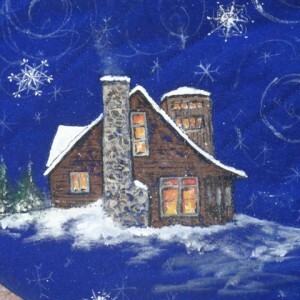 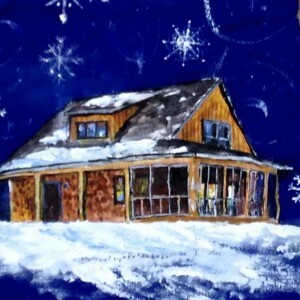 The houses in the snow references the Dad’s profession as an architect. 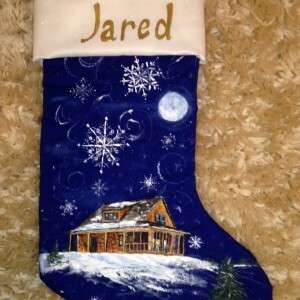 I ended up updating it which is why there are two versions of the Jared stocking!!! 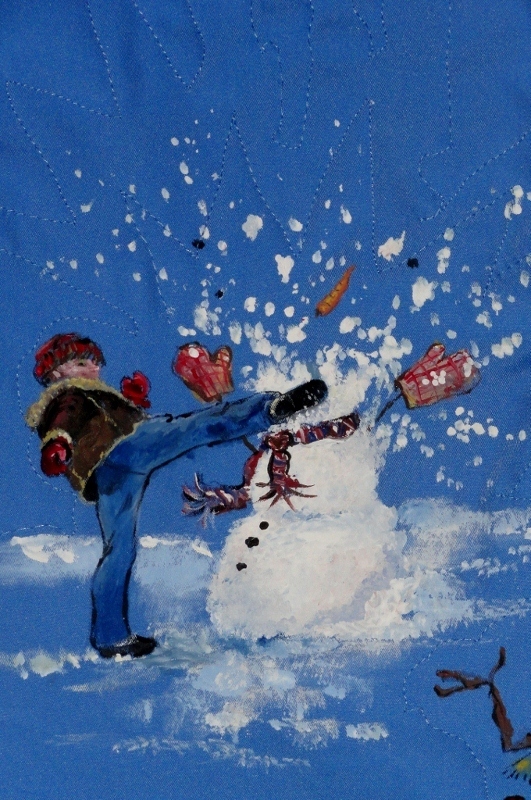 I placed the painted cotton fabric on quilt batting and machine quilted around the larger areas, and stitched straight lines of quilting on the back side. 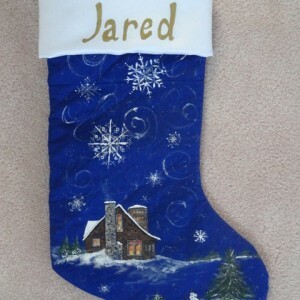 The approximately 16″ tall stockings have a satiny lining and a cuff on the top with the painted name name of each family member.. A sturdy loop is stitched into the top back edge. 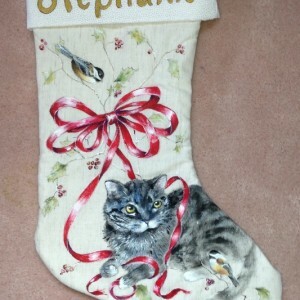 If you are interested in having me paint stockings for your family please contact me through this site. 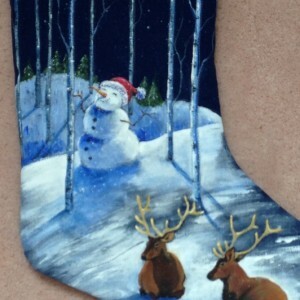 Taking orders now for December 2014 4 stockings for $400, 2 for $250. 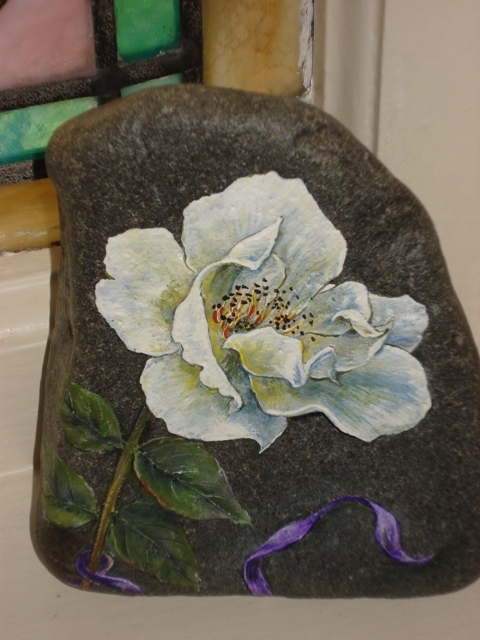 This life size wild white rose is painted on a chunk of stone. 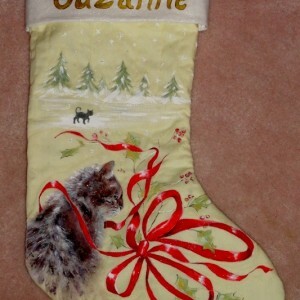 Simple and elegant with a little bit of purple ribbon.